“Harness racing is an exhilarating sport, with the likes of Somebeachsomewhere, Deweycheatumanhowe, Art Official, St. Lads Popcorn and Nebupanezzar continuously thrilling us with exciting competition! However, some Standardbreds never reach this level of racing notoriety and we firmly believe that these horses, the ones who have finished their careers on the track, are still very well suited at learning a new discipline. They are intelligent, able and willing to please. It is our hope that we can erase the myth that standardbreds have no other purpose other than racing. Two horses taken in by New Horizons Equine Center just outside Dresden, Ontario, Canada get acquainted in snow-covered paddocks. Owned and operated by Claudette Lemesurier, the center focuses on re-training and finding homes for off-the-track Standardbreds. CLAUDETTE LEMESURIER is the owner and operator of New Horizons Equine Center in Ontario, Canada. 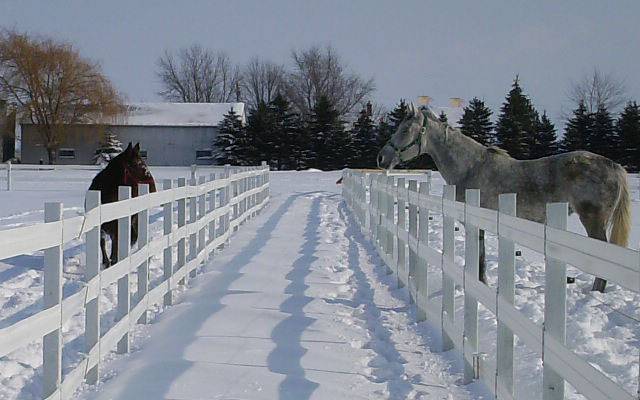 New Horizons got its start when they purchased a 50-acre farm just outside Dresden, Ontario in May 2008, and have been adding paddocks, barns and other essentials necessary to begin taking off-the-track Standardbred horses. Claudette chose the location because it is within an hour or two of five major Ontario Standardbred racetracks: Western Fair Raceway, Windsor Raceway, Hiawatha Horse Park, Dresden Raceway and Woodstock Raceway. Dresden raceway is the closest, about 5 minutes away. New Horizon started with one horse, and are now up to four, with plans to add to the existing barn so they can re-train and rehabilitate more. I decided to start this rescue because I’ve always loved horses and at the same time, as I grew older, became more aware that too many horses, Standardbreds in particular in my area, were going to slaughter. These were young, sound, and vibrant horses, that could still learn a new discipline and were more than willing to do so! I love harness racing and at the same time, never stopped to think about what happened to them when they were no longer racing. The primary focus at New Horizons is preventing Standardbred horses from going to OLEX, the Ontario Livestock Exchange, in Kitchener, Ontario. That in and of itself can be a brutal experience for these horses. It is always confusing and frightening. There are at least 25 Standardbreds on average going through their ring every Tuesday,” says Claudette. I’ve also taken two horses directly off the track, Yankee Buck, who has a fractured coffin bone that’s currently being treated, and the other, Whiter Than Snow, called Poppy, a grey 16.2 hh Standardbred mare, who just wasn’t fast enough. Then, I had one given to me, Grapes Magic Trick, who’s already trained in Western pleasure. Then there is their most recent acquisition, Kalos (which means beautiful in Greek), called Pickle. Pickle is a yearling with a facial deformity similar to “wry mouth.” Pickle was rescued from the hands of a killer buyer at OLEX. 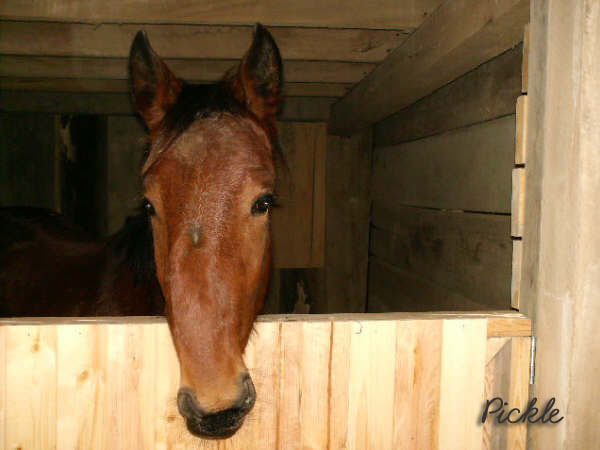 Pickle is a yearling with a facial deformity who went through the ring at Ontario Livestock Auction. No one wanted him. He was a no-bid. New Horizons rescued him, and took him back to their facility. 'He's the sweetest yearling you'll ever meet. Very respectful and now, very happy,' says Claudette Lemesurier. Right now, it’s Pickle’s story that stands out to Claudette. I received a call on December 29th from a gal who started the group and blog, Horsemen For Humanity. She attends these OLEX auctions every Tuesday and tries to place horses so that they don’t end up on the kill truck. She told me there was a beautiful Standardbred stallion standing in the pen, waiting to go into the ring the next day. Well, we put our heads together and agreed that if she knew he was going to kill, we’d buy him on the spot. It so happens that the next day at the sale, he ended up going to a good home, so we didn’t have to purchase him. What she did notice though, was a yearling, with a facial deformity who went through the ring and no one wanted him. He was a no-bid. At that point, she thought he may have had a facial fracture. We didn’t know the whole story about him. Anyway, she calls me and tells me about this little yearling and posts a photo of him on her blog. Well, that was it for me. I made many, many calls to find a trailer (which I ended up buying) and made the trek 3 hours up to Kitchener to get him. She secured him for me until Friday, January 2nd. We met there, loaded him up and made the 3-1/2 hours back here to New Horizons. He’s the sweetest yearling you’ll ever meet. Very respectful and now, very happy. The feelings of reward, fulfillment and achievement are many. Claudette sums them up as, “Being able to give these horses a second chance at a new career and trying to erase the myth that Standardbreds are only successful on the racetrack. Some are, some aren’t. I suppose the ones that aren’t are the ones I like to focus on. But no matter what, they can all have purpose.” There’s also very little sleep. Not that it matters to Claudette. Throughout her life’s journey with horses, working for a time as a jogger and groom at L’hippodrome Blue Bonnetts in Montreal, Canada, Claudette says along the way she has always learned something new every day. Setting up and running a rescue has added new dimension to those lessons, and most particularly, responsibility. Claudette says she wishes more people understood that being responsible for horses is just that — a responsibility — and a big one. And not just when they are useful for the purpose people have them. People need to realize that owning horses is a big committment, and if it comes time that they can no longer care for them or the horse is no longer enjoying a quality life due to an incurable injury or illness, then it’s their responsibility as a horse owner to take the time to do the right thing. Whether it be re-home them for a new career, or humanely euthanize them if there quality of life is hindered, the responsibility for that horse’s health, safety and welfare is theirs. Definitely not slaughter. Overbreeding — trying to find the next “Home Run Horse” — that can no longer be allowed in our society, unless these people start being held accountable in some way for the future of the horses they bring into the world. That could a particular horse’s retirement or aftercare. Then there is the spectre of slaughter she wishes many more people knew about. One of the biggest misconceptions, about racehorses anyway, is that when they are done with a career, they live out the rest of their lives in lush green pastures, while frolicking happily in fields with their herd mates. Yes, some are lucky enough to do this, but the reality of it is . . . many, way too many, end up in the slaughter pipeline. What advice does Claudette have for anyone considering taking on such a huge responsibility as running a horse rescue or rehabilitation center? Ensure you have a business plan. This is not something that can or should be run if you have a shoestring budget or limited knowledge of horses. If such is the case, where your funds are limited, sponsoring a horse or even donating to an already established rescue/rehab facility might be the better route for you to take. If your knowledge of horses is limited, volunteering at a local equine rescue can help you learn and at the same time, it’ll allow you to be part of a team, a team that saves, retrains and rehomes equines. These strategies can be very fulfilling as well to someone who cannot run the entire rescue operation on their own. 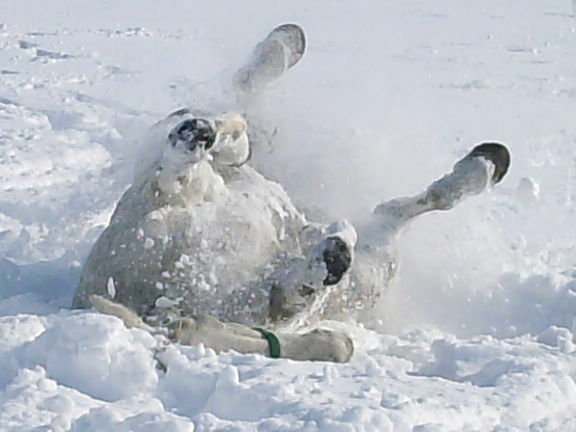 A happy, happy horse takes a roll in the snow at New Horizons Equine Center near Dresden, Ontario, Canada. As New Horizons expands their facilities so they can take in more horses, their most urgents needs are additional stalls and fencing. Raising money is always center stage to an operation like the one at Claudette’s equine center, and they are planning some fund raising events for the summer. In the meantime, donations of cash or supplies, feed, grain, fencing . . . anything like that . . . are welcome. Claudette clarifies their tax status for anyone wishing to make a donation. “We are NOT a charitable organization, we are a Not For Profit. That means if people donate, we cannot provide them with a receipt, unless they are a business. Then they can write the expense off themselves through that route. Horses are Claudette’s first love, and now her business. When someone says “horses,” her response is, “Where, where?!! ?” She names Barbaro, Ferdinand and Exceller as the horses having the biggest impact on her and a big reason she does what she does. Personally, Claudette credits horses with teaching her patience, understanding and accepting yourself just the way you are. “They can heal you from your innermost fears, they can teach you to trust again,” she adds. To get involved, make a donation or have a fundraiser to purchase something on New Horizon’s Wish List. Join New Horizons on their Group Facebook page. Now sit back and watch what salvation looks like through the eyes of a horse called Pickle.